As usual, I have too many projects planned for this winter, but before I can start any of them, I must finish Cabin Boy's long-awaited refit. At the moment, I'm trying to varnish all the bits that I intend to leave bright. This was going to be a rather short list -- just the seats and transom -- but the list has grown to include the stem (an obvious addition), the inwale, and the seat stretcher. Everything else will be painted white, with bottom paint on the bottom, since Cabin Boy will spend next summer in the water at the club dinghy dock. To get as far as I have, I had to learn a few tricks. First off: how to sand all the hard-to-reach spots, like the inside sides of the stem. As I quickly discovered, no power sander can reach into the narrow space between the stem and planks, and its even too tight for a sanding block. The obvious solution is to tear off a bit of sandpaper and go at it by hand, but it's surprisingly hard to get a floppy bit of paper to do much work. First, choose a piece of sandpaper. 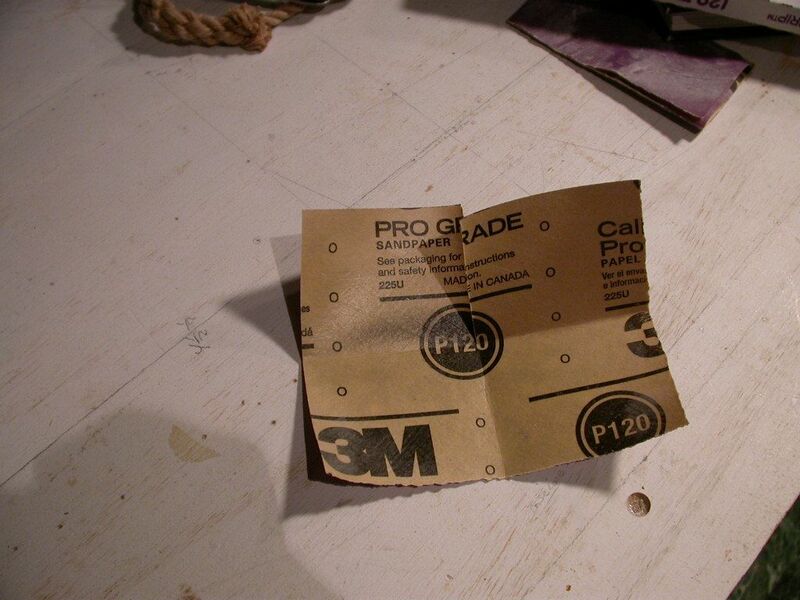 For this example, I needed a fairly small piece of 120 grit paper, so I started with 1/4 of a sheet. 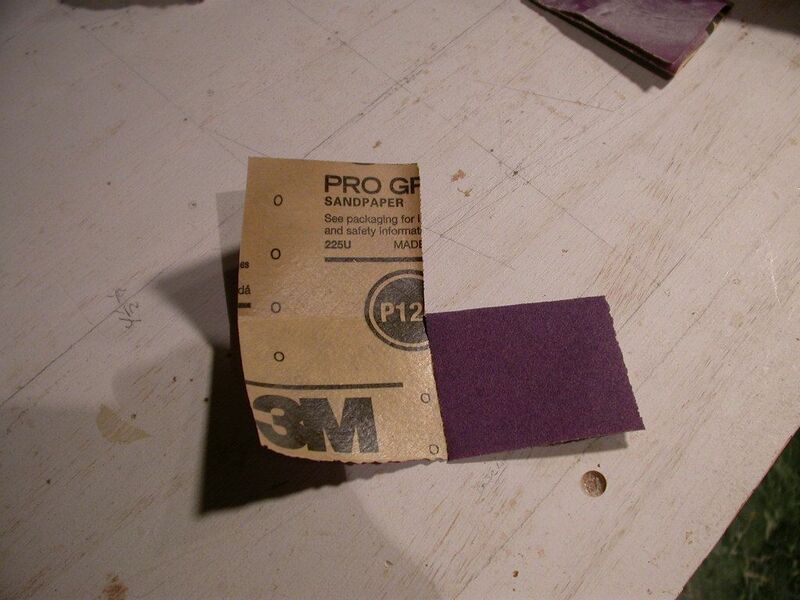 'Break the back' of the sandpaper by pulling the paper over the edge of a table, sand side up. Do this from all 4 corners, across the whole width of the sheet. 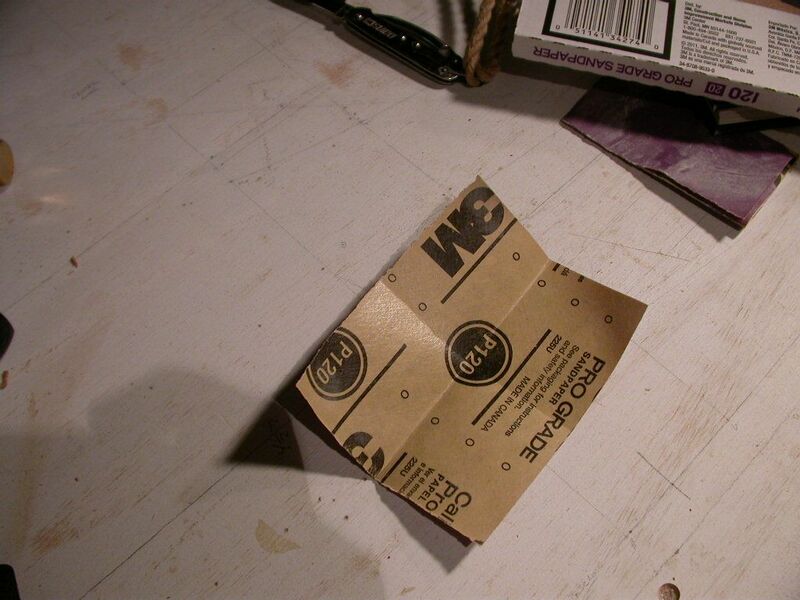 You will end up with a curled, much more pliable piece of paper that won't crack when you fold it. the whole width of the paper. 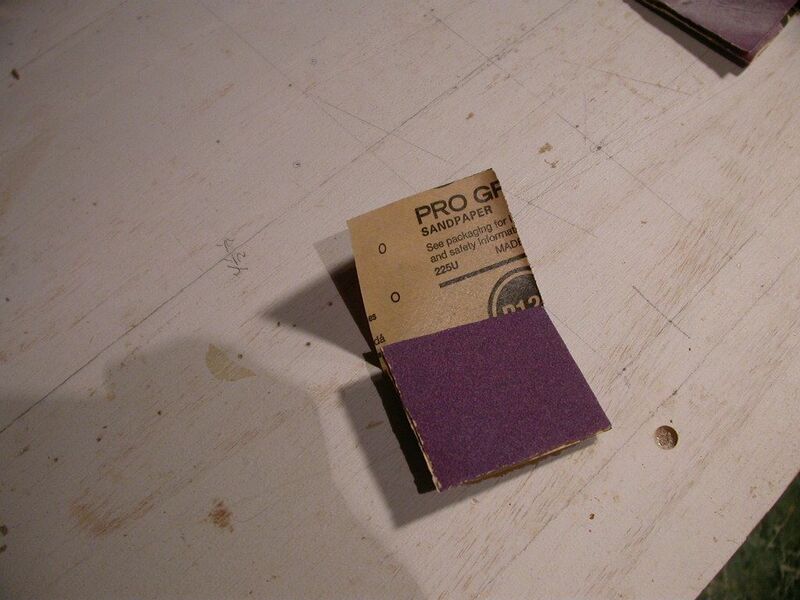 Next, fold the paper twice to make a '+' type crease. You can see how the paper is curled in all directions from the first step. Then take your knife and slit one of the creases. It really doesn't matter which, but I usually choose one of the short creases. You'll end up with a small, but fairly stiff piece of paper that is much easier to use in tight spaces. 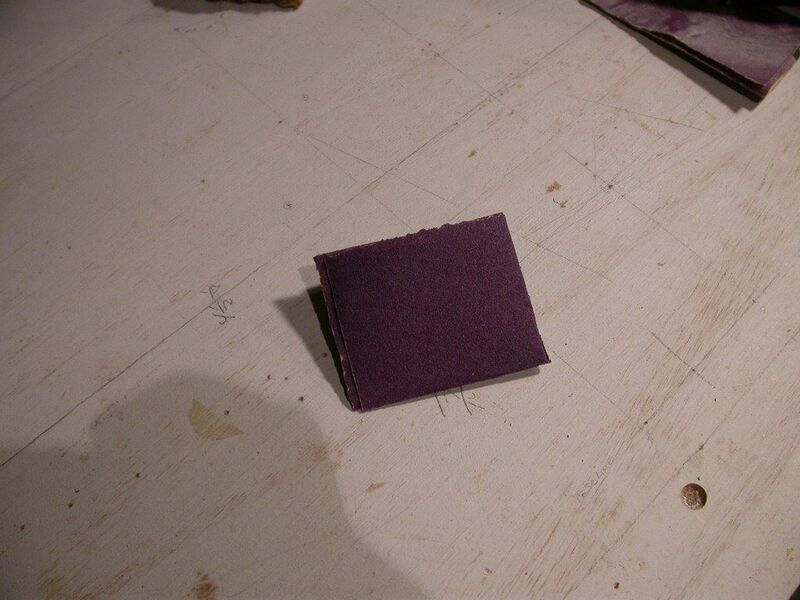 It gives you 4 good sides to work with: the two sides of the original square, plus the two sides hidden inside. When you use up the two outside sides, you can refold to get the two inside sides. 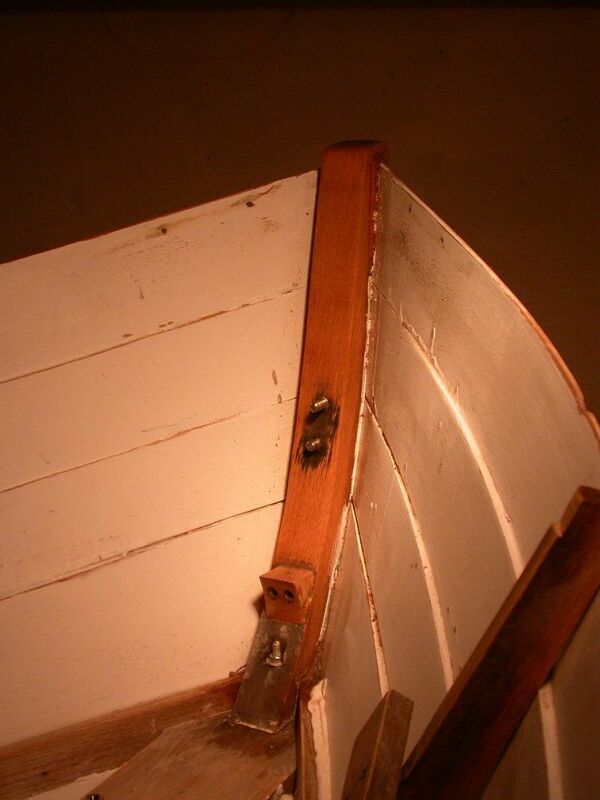 This simple trick made sanding Cabin Boy's nooks and crannies much, much easier. It's hard to imagine how well it works until you try it. "In very small sizes the flat-bottomed rowboat is satisfactory and it is easily pulled except in very rough water. It is a good carrier and is strong, but it can seldom be towed satisfactorily. However, it has the advantages of cheapness, ease in building and repair, and of being able to take a lot of punishment on a beach or at a wharf; and is a common type. Properly designed and taken out of the “box” class, the flat-bottomed, or sharpie, rowboat makes the best all-round boat for most small-boat uses. "Round and V-bottomed small boats are treacherous, cranky craft until they reach a length of about I2 feet. In the smaller sizes they have most of the bad characteristics of the canoe and none of its good characteristics. They tow fairly well, they can be sailed, well in conjunction with a smart yacht when davited or decked. Repairs are difficult. Unless very lightly built, they are heavier than the flat-bottomed boat and therefore offer more difficulty in beaching and stowing. In larger sizes, such as cutters and whaleboats, the advantages of round-bottomed construction and design become apparent, and they become able boats." -- Carl D. Lane in "The Boatman's Manual"
Obviously, William and John Atkin felt that flat bottom boats made the best dinghies, since most of their 'little' boats are flat bottomed. As I think I have mentioned before, my club restricts dinghies to 8' by 4'. Much as I love Cabin Boy, he really is a bit too small for two people and a load of gear. I would like to cram as big a boat into that 8'x4' box as possible, which means a pram. An 8' pram has most of the buoyancy and thus carrying capacity of a 10' boat, without the length. I also want to build a round-bottom boat, that being the obvious next step in my boat building education. Surprisingly, the Atkin catalog does not contain an 8' round-bottom pram. Lots of flat-bottom prams, but no round bottoms. I thought of stretching something like the beautiful Katydidn't, but modifying plans goes against the entire Atkin ethos. Katydidn't on the way to Block Island? Oddly enough, neither did Paul Gartside, arguably the most Atkin-like designer of today. He almost seemed surprised when I pointed this out, and said he'd need to draw one eventually. But I had to keep looking. Eventually, I discovered what I was looking for in Iain Oughtred's catalog: Humble Bee. 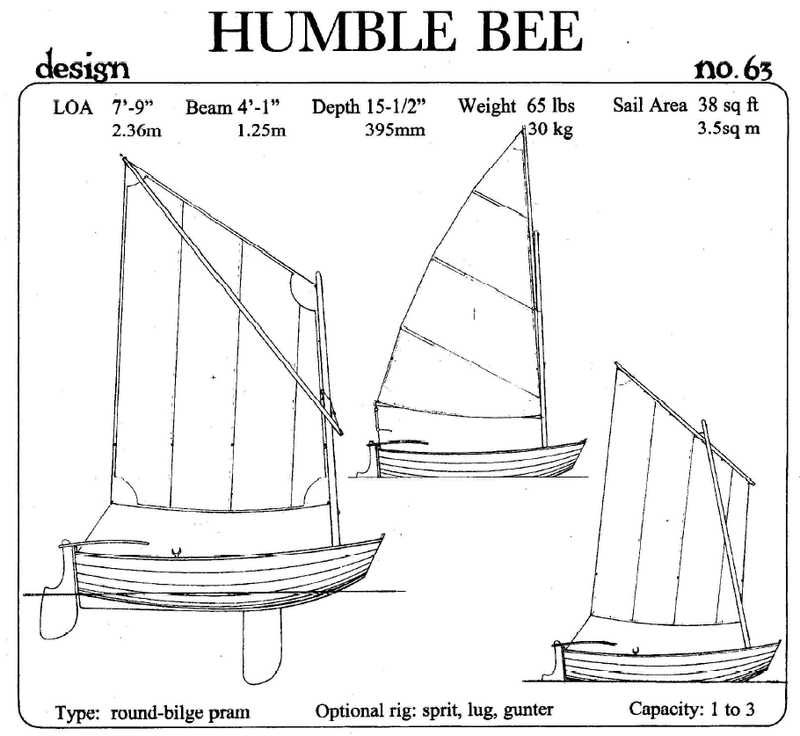 So Humble Bee is my boatbuilding project for this winter. Though Iain is known for his glued lapstrake designs, Humble Bee also includes construction drawings for a traditional build, and that is what I intend to do. Call me a throwback, but I'm frankly fed up with epoxy. It's a great product and takes a lot of the difficulty out of boat building, but as I've said before, easy is overrated. So why did I quote Mr. Lane above? Because he raises an interesting question: which makes the better dingy, a round bottom, or a flat bottom? It should be a snap to build Rinky-Dink by the time I get to it, but I've always wanted to try a cross-planked bottom, so it will have lots of new challenges. Anyway, that's the long range plan. More next time. What's your thoughts on the Nutshell pram? I like it, but as far as I can tell, the plans are for glue-lap construction, only. I wanted plans that include traditional construction drawings. You might want to peruse John Gardner's books on Small Boats. It has about three v bottom prams and a round bottom pram design by L. Francis Herreshoff based on a Norwegian model. Also, Reuel Parker has 8' prams in plywood. 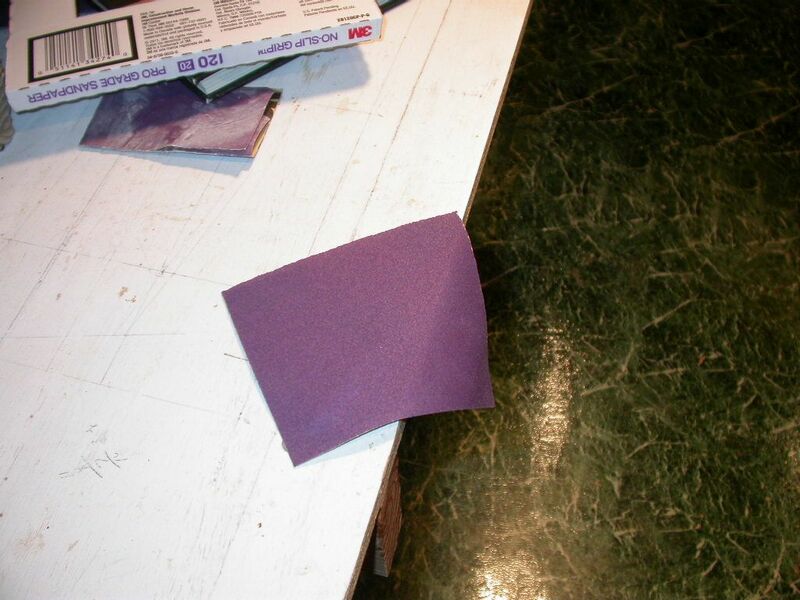 Regarding folded over sandpaper, you can also try buying adhesive backed discs, which, folded over and stuck together, form a stiff "package." A V-bottom pram. That's interesting. I'll have to get the book from the library. Thanks! Those adhesive backed disks would be a pretty expensive alternative, wouldn't they? I like to switch sandpaper fairly often. No sense slaving away with a worn out bit of sandpaper when a new piece works so much better. Yes, Humble Bee came with lines and offsets, so I'm going to loft her myself, and of course line-off the planks. I see Granny also has the flat bottom plank. I'm thinking that will make these prams more stable than typical round-bottom prams. What's your experience? I thought the bow rode a little high, but when I got out in the slop, it was excellent. My wife went on the inaugural, and she is paranoid about the sea- one really bad experience - and she felt completely safe and comfortable. The day we went out it was blowing about 8-10 knots and the little boat was really dry. Four people max in a Granny. "I thought the bow rode a little high..."
Did you install the second pair of oar locks, and were you rowing from the bow thwart to balance the weight? That is why I have torn out my thwarts in Cabin Boy and am replacing them with a fore-and-aft rowing seat + stern seat. These boats are so small that you need to be able to carefully adjust your trim.